During World War Two 125,000 aircrew served in RAF Bomber Command with 55,573 of them becoming lost on operations and through accidents. Throughout the war Bomber Command took the fight to the Third Reich often in the most adverse of circumstances. 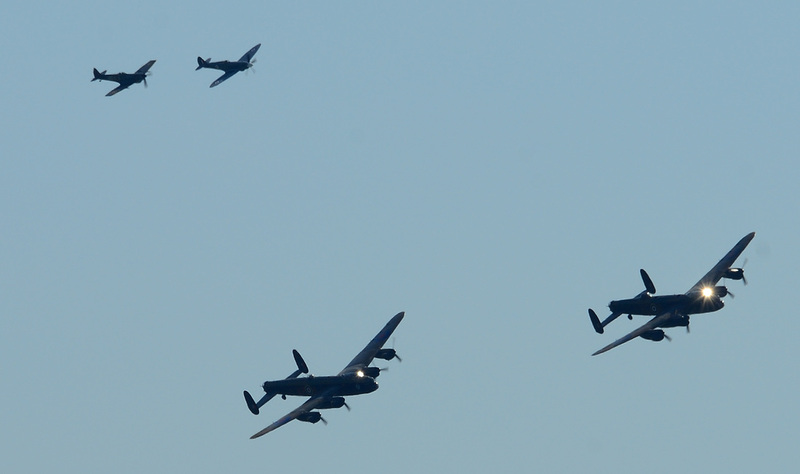 In the early days Bomber Command flew Wellingstons, Hampdens, Whitleys and Blenheims. Daylight raids early in the war proved disastrous due to the lack of fighter cover and also inadequate armament. It soon became clear that bombers armed with .303 machine guns could not defend themselves against canon armed fighters. This was proved in the Battle Of Heligoland Bight in December 1939 when ten of the twenty two Wellingtons that took part in a raid on the German Navy were lost. Tactics were changed and the bombing campaign took to the night skies. This brought its own problems with regards to navigation and actually finding the target to be bombed. As the war progressed so did navigational aids but also the defences in the Reich became more formidable with mass concentrations of flak and heavily armed radar equipped night fighters. A deadly game of cat and mouse developed between the RAF and the Luftwaffe with the advantage swinging between both sides as technology and tactics changed. As the war progressed heavy four engined bombers in the shape of the Stirling, Halifax and Lancaster took increased bomb loads to Germany and losses continued to mount. In the latter stages of the war electronic countermeasures, RAF night fighters, the USAAF 8th Air Force's daylight campaign and sheer weight of numbers succeeded in defeating the Luftwaffe over Germany but not without huge losses amongst the bomber crews. The bombing of Dresden and the resulting firestorm saw the British establishment distancing itself from the RAF's bombing campaign and its leader Arthur Harris. This ultimately led to the crews not being given a campaign medal or being recognised for their bravery and sacrifice. This has only just recently been addressed with the creation of the Bomber Command Memorial in Green Park and the striking of a medal for campaign veterans. 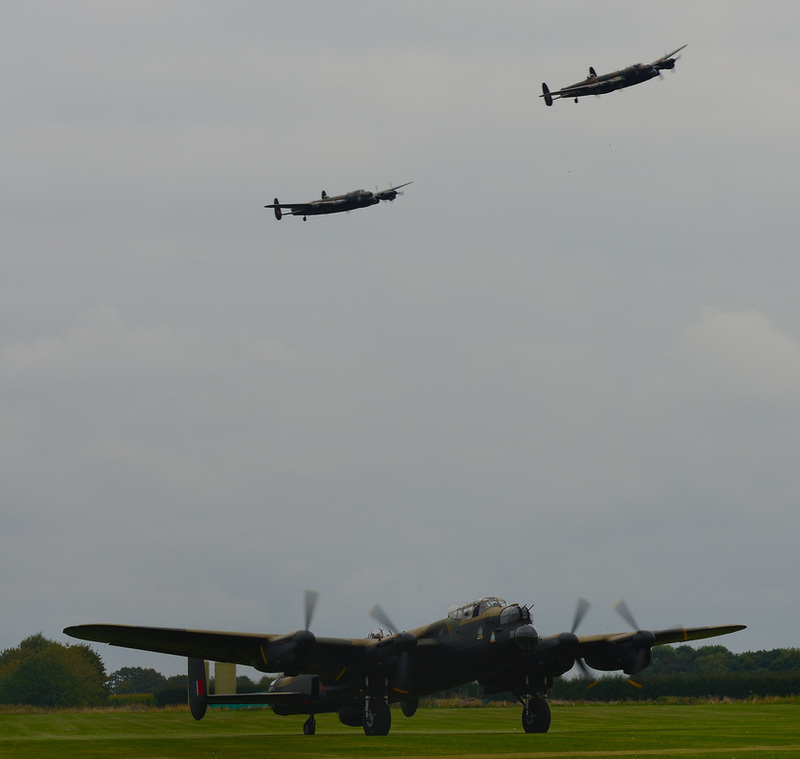 With public awareness raised about the wartime exploits of Bomber Command it was announced in February 2014 that the world's only airworthy Lancaster outside of the UK would fly to RAF Coningsby. This raised the prospect of seeing two of Avro's finest in UK skies for the first time since 1956. 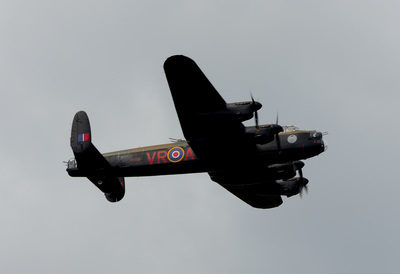 On August 8th Lancaster MK X FM213 of the Canadian Warplane Heritage Museum landed at Coninsby in typical British bad weather after a long flight from Canada. The North Atlantic crossing included en-route stops at Goose Bay, Labrador, Canada, Narsarsuaq, Greenland, and Keflavik, Iceland. 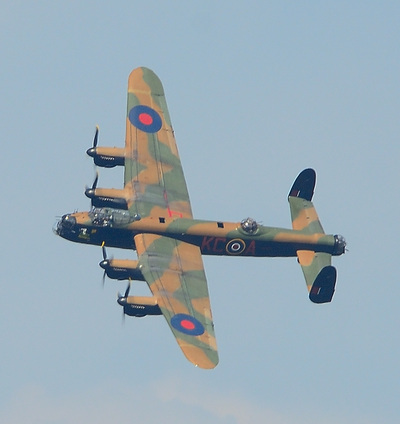 During August and September 2014 Lancaster B.1 PA474 of the Battle Of Britain Memorial Flight and Lancaster MK X FM213 have been scheduled to fly at a number of airshows and events around Britain. Public interest in seeing the two Lancasters has resulted in a much bigger turn out at airshows with many events selling out. FM213 is painted and marked to represent Lancaster X KB726 coded V-RA. The aircraft was part of No 419 (Moose) Squadron flying from RAF Middleton St George. On the night of 12 June 1944, 419 were tasked to bomb the rail yards at Cambrai France. This was the crews 13th mission and flying as mid upper gunner this day was Andrew Mynarski. As the Lancaster neared its target the aircraft was attacked by a Junkers JU88 night fighter which set fire to two engines and also caused fires to break out within the fuselage. The order was given to bail out and Mynarski left his turret but was confronted with the sight of the rear gunner Pat Brophy trapped in his turret due to severed control lines. Despite the intense heat and with disregard to his own safety, Mynarski went to the aid of his friend. He was unable free the gunner from his turret and he had not noticed his own flying suit and parachute had caught fire. Seeing the situation as hopeless Brophy indicated to Mynarski that he must save himself. Reluctantly Mynarski complied but as he was about to leave the aircraft he turned and saluted his friend Brophy. Mynarski was seen to plunge earthwards in flames and was found badly burnt and died within hours. Ironically Brophy survived as the Lancaster crashed at a shallow angle with some of the bombs exploding which threw the gunner clear. For his selfless act of bravery, Mynarski was awarded posthumously the highest honour of the Victoria Cross. 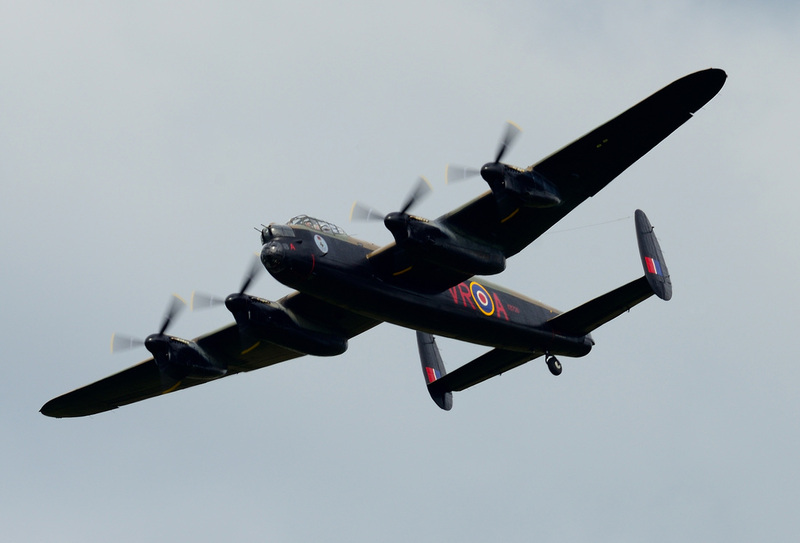 It is especially fitting that the Canadian Lancaster has visited the UK in 2014. 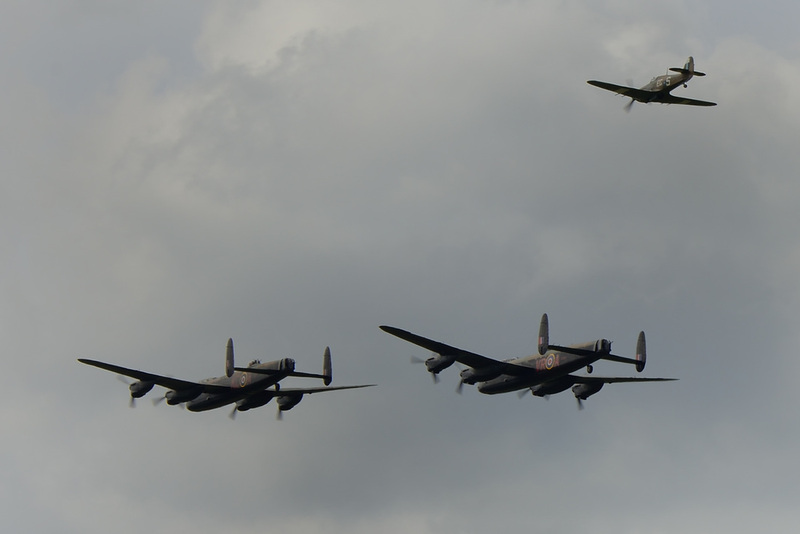 This has given some of the surviving Bomber Command veterans, who are now in their 80th and 90th years, the chance to see again the sight and sound of two Lancasters again flying in formation. For so many years the crews of Bomber Command have not been given the respect they deserve and their sacrifices have for too long gone unrecognised. However, recent events will hopefully go some way to addressing this and place the veterans and those who did not return, rightfully in the minds of the past, present and future generations.